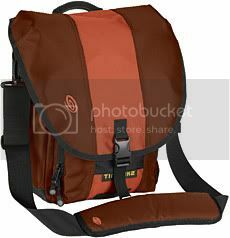 Timbuk2 has released a new computer bag called the Blogger. It features a ballistic nylon exterior, a three-panel design, a built-in padded laptop compartment, two exterior pockets and a rubberized bottom. The pack can fit up to a 15″ Powerbook, so if you’re looking to tote some mammoth portable, you should look elsewhere. The Blogger appears to be a decent little bag, but to carry that name, I’d think it should be capable of carrying an SLR in addition to a laptop. What’s a blog without pictures, right? Right? !